In Capital Forecast you can attach files or hyperlinks to a Building Component. Any Building Component with an attachment will appear in your Building Components list with a paperclip icon ( ). *Note: Adding an attachment to a Building Component will automatically add the attachment to any associated Needs. Click the Building Components tab. Select the desired Building Component by clicking on the Component ID. Scroll down to the Attachments section and click Add New Attachment. In the Attach File window, make sure the File Resource Type is selected. Click the Choose File button to select the file from your computer. *Note: The size limit for attachments is 5MB. Click Save to add the file attachment to the Building Component. Once the file has been added to the Building Component, you can edit the file by clicking the pencil icon ( ) or delete the file by clicking the delete icon ( ). 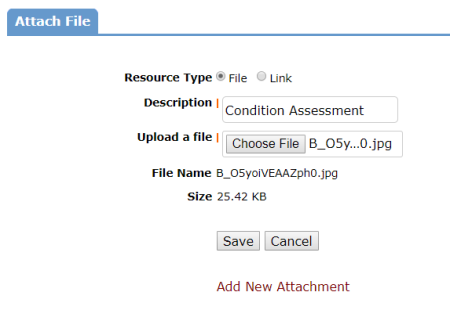 In the Attach File window, choose the Link Resource Type. Click Save to add the link to the Building Component. Once the link has been added to the Building Component, you can edit the link by clicking the pencil icon ( ) or delete the link by clicking the delete icon ( ).